Sri Sri Tattva Honeyis used as a versatile ingredient and it adds flavour to different kinds of foods. It is also beneficial as an expectorant and various other uses for face packs, skin related formulations. 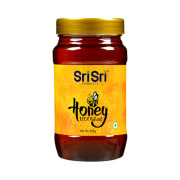 A licensed pharmacy from your nearest location will deliver Sri Sri Tattva Honey. Once the pharmacy accepts your order, the details of the pharmacy will be shared with you. Acceptance of your order is based on the validity of your prescription and the availability of this medicine.